If you are going to invest in a house on the lake, then most likely you are going to want a deck overlooking that gorgeous water; a place to enjoy the sunrise, the sunset and everything that happens in between. Many of the decisions about your new deck will depend on the house and the space with which you have to work. But whether you are starting from scratch or adding upgrades to an existing deck, there are many ways you can take your deck from functional to fabulous. Even though you may have an idea of what you want in a new deck or how you want to improve what already exists on your house, it is recommended that you consult an expert. 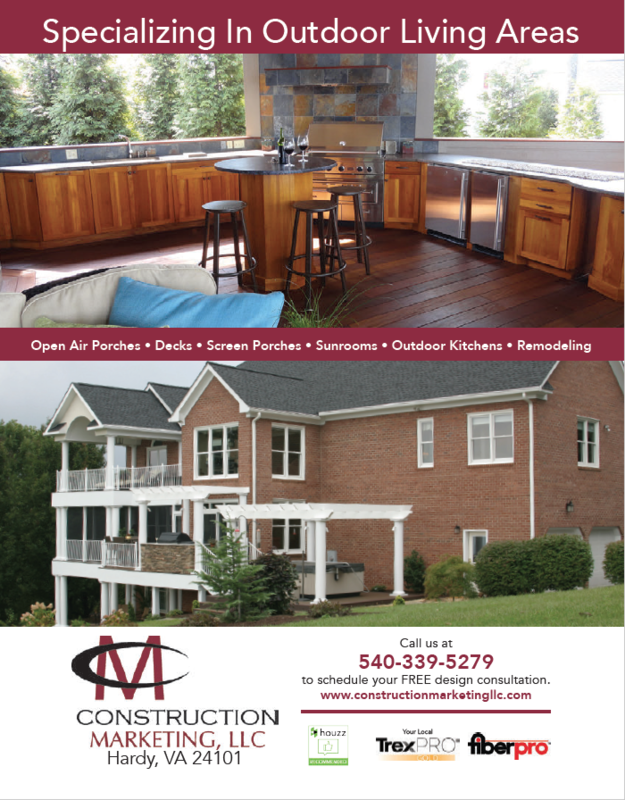 Mark Maslow of Southern Landscape Designs has great advice if you are starting a deck project. He recommends finding someone who has completed at least 20 to 30 projects. “Work with an experienced contractor who has the capability to design and plan your space. A great deck designer can help you with shape, flow of traffic and use of space,” he says. A qualified professional will also be able to help you with improvements on an existing deck. They will be able to evaluate what you like and what you don’t like and make changes based on how you want to use the space in the future. Also, building codes may have changed since your deck was built, and a knowledgeable contractor will be sure to keep things up to code. One of the first decisions you will need to make regarding your deck is what type of material to use. A classic choice that is also budget friendly is natural wood. The most cost effective choice in natural wood is pressure treated wood. It can be stained virtually any color and will last about ten to fifteen years with proper care. That care includes power washing, staining and sealing your deck annually. Maslow recommends using two-inch by six-inch boards, which are sturdy and will hold up better over time than a thinner board. The main drawback to using pressure treated wood is that it contains moisture, which can cause problems when it dries out. It can warp and split and could require you to make repairs. If you upgrade to choice or premium treated boards, you will incur a greater cost, but they are kiln dried and will last longer and look better than regular pressure treated wood. You can also use a higher quality wood like redwood or cedar, which has a beautiful natural color and is rot resistant. Both have about a fifteen year lifespan, and will need to be cleaned, stained and resealed every two years to keep the natural color from fading to gray. If you use this type of wood, plan on paying two to three times the cost of pressure treated wood. 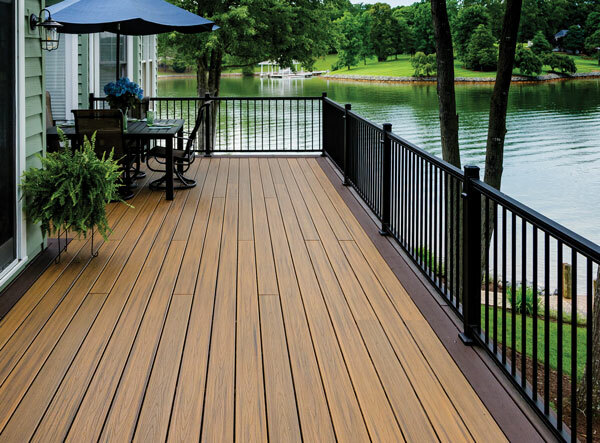 In order to maximize the view and complete the look of your wood or composite deck, you will need to choose the right kind of railings and balusters. According to Bryant, “Smaller posts and balusters that do not obstruct the view have become really popular.” Of course if you want a completely unobstructed view, you can opt for no railings at all, if your deck is close enough to the ground. However, if you are trying to keep in pets and small children, this may not be a viable option. “Glass panels are the best option to view the lake and your surroundings,” notes Bryant. Glass panels can be an amazing addition to your deck; they will compliment any style of home and are relatively maintenance free, requiring a simple cleaning every so often. They are typically made of quarterinch- thick tempered glass which won’t crack or break, and will last a lifetime with proper care. However, as beautiful as glass is, there are drawbacks. It is one of the most expensive ways to enclose your deck. It can also produce a “greenhouse effect,” causing your deck to be warmer in the summer months. This can be avoided by using glass balusters instead of solid panels. 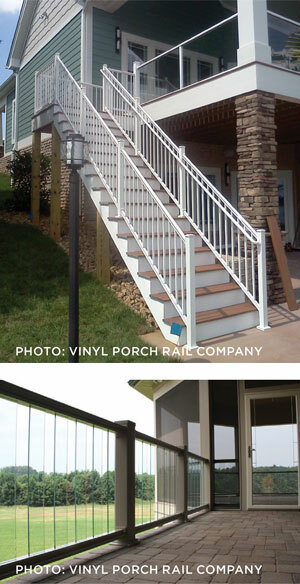 Another classic look for your deck is the use of wrought iron. 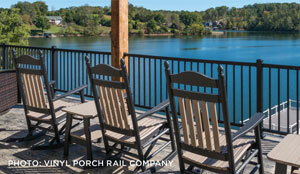 These days wrought iron railings and balusters not only provide a great view from your deck but also are works of art. The possibilities and designs are endless and can be custom made to match your style and taste. Wrought iron is strong, durable and long lasting. It looks great with wood, composite or vinyl accents and is easy to maintain. It may require painting every two to three years to prevent rust or corrosion, but overall is a good choice if you are looking for a product that is low maintenance. Although not as expensive as glass, it is one of the more costly choices for homeowners today. If you are looking for a lower cost alternative to glass and wrought iron, vinyl railings and balusters are the perfect choice for your deck. There are so many benefits when using vinyl. Jason Nuckles, of the Vinyl Porch Rail Company in Lynchburg, says they receive a lot of requests for vinyl railings with composite accents. Vinyl is easy to install and is long lasting; according to Nuckles, “Quality vinyl will carry a lifetime warranty.” It also provides privacy, will not chip, crack, peel or blister, and is resistant to mold, mildew and pests. If you are looking for low maintenance, vinyl is at the top of the list.